So in the end, while being wrong in the premises, you're right in the end: religions do teach the fear and disgust of life. Isn't it rather the opposite of both of these, too? All religions teach a certain amount of fear about living in certain ways (generally, anything the elders of whichever church disapproved of), but in all of them life itself has an enormous value as it determines what will happen for the rest of eternity. In a way, that's pretty much the point of all religions: you get your three-score-and-ten to earn your place in whichever version of heaven (or the next cycle of the great wheel etc etc). Get it right and death should hold no terrors, get it wrong and there will be some quite unpleasant long-term consequences. no, no, no, no. ; your interpretation is one of a modern guy, not sticking to any kind of dogmatic teaching. But all religions are dogmatic, they have to since they pretend they hold the Truth. They have to be very precise about what they approve and disapprove and how the faith has to be lived accordingly to the beliefs they wnat to transmit. So, disgust of life or retreat from life and all its pleasures is seen (or has been seen) as a way to stay pure. Pure of any temptations, since you refuse them all. Sure, you're invited to be charitable, be nice to your neighbour as so on, but without too much joy which, as is taught, is an open door to instinct and chaos. Reason should dominate the instincts and reason demands to stay as sober as possible. That means, in the end, seen under the perspective of a man willing to enjoy life, the end of all joy, a huge wall erected between pleasure and salvation. Yes, to a point. I would certainly agree that all religions are quite proscriptive about what sort of a life should be led, although that hasn't always had a puritanical or fully dogmatic basis, particularly in either the more 'primitive' or more 'enlightened' ends of the spectrum. * I may, as a very lapsed Greek Orthodox baptisee, simply follow the lead of all High Churches and repent sincerely on my deathbed. That wouldn't be a bad investment of five minutes, just in case. I can just repeat what I've already said: if we stick to Christianity, the whole purpose of the Church, and what held it together for so long was its ability to depict a better life in the afterlife: hold steady, a beter future is awaiting you beyond death, death is a gateway to eternal happiness. It's so comforting that is has been enough to ensure the prosperity of the Christian Church during all its history. After all, man is doomed by the primordial sin. The call to follow in the footsteps of so many vertuous saints, starting with Jesus Christ, whom are prayed and worshipped is also a way to curb any will, any temptation to individually take advantage of what is commonly considered as direct, easy pleasures; I mean just as simple a joy as eating and drinking or making love, earning money, getting rich… don't forget that at some point, theater, and even the simple fact of laughing have been condemned as slighting attitudes. And more: the spiritual efforts that are requested to get to salvation are always the more joy-deprived ones: abstinence, fasting, mortifications in the most extreme cases. Id did not say that religions have taught to deny death, but that they do deny death. That's an entirely different claim. Most religions deny death by assuming that the soul survives in some kind of afterlife or reincarnates. Buddhism denies death by claiming that there really is any person/self that dies (with the exception of Pure Land Buddhism, which opts for the surviving soul). In other words, denying death is the core idea of most (if not all) religions. This is hardly a new or controversial idea; it was popularized by Ernest Becker's (1973) The Denial of Death. I'm not sure that we are really disagreeing, by the way. Perhaps you misunderstood what I mean with "denying death". Sorry again, but you are placing yourself outside the debate; let me explain: in fact, yes, it seems I took the word "death" in your mouth for the "concept of death", that is the end of all material life, which is, in a spiritual perspective, hardly a big matter. But you are in fact talking of your own conception of death... and I'mnot sure I can quite follow your reasoning here. Because You can't judge the way religions deal with death if you stick to your non-religious conception of that moment. To me religions DON'T deny death, death is a very important religious concept. it is the core of the religious belief. But if to you death is the end, kaputt, nothing after, great oblivion, then the debate is skewed, and you can't apprehend the religious way of seeing things. Because we are simply talking about two different things! 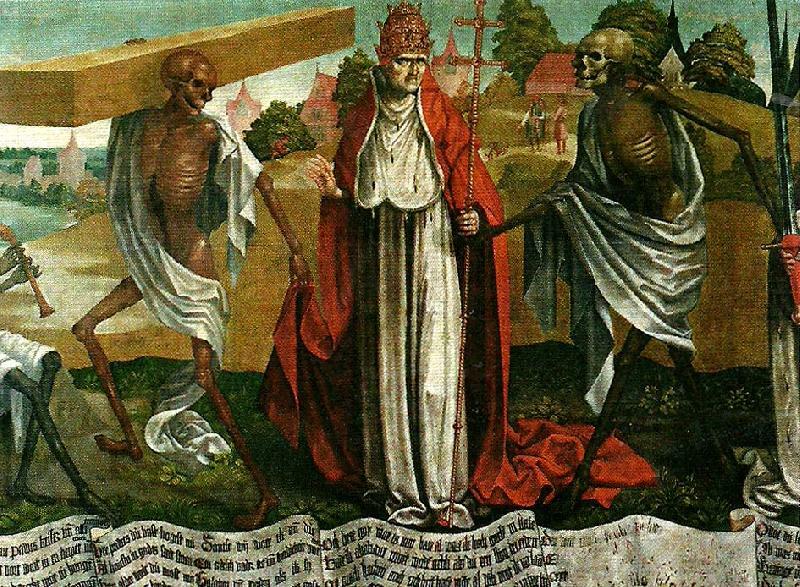 The way I use the term "denying death" is pretty much standard in philosophical thought about death and religion, at least since Becker's book. Hence, I'm not using strange or idiosyncratic terminology (or "my own conception of death"); I'm using standard terminology. If that apparently is not allowed here, then it is not me who is placing himself out of the debate. Well, then nothing can be discussed if the terms are understood differently. And if you allow me, I'd say that any philosophical thought should always question standards; I didn't suspect the group of words "denying death" was a standard philosophical terminology! I don't see why "denying death" should be the lexical prerogative of a school of thought which would have arbitrarily given it a meaning limited to its own conception of life and death. I mean, "denying death" ... so what? In it self that doesn't mean much if the philosophical concept underlying this posture isn't clearly identified. The conclusion is simple: death is final; there is no 'surviving' death. Denying that is not open minded or "thinking outside the box" as you suggest - it is self-delusion. I think it's helpful to distinguish between physical death and spiritual death. Spiritual death is more open to debate. 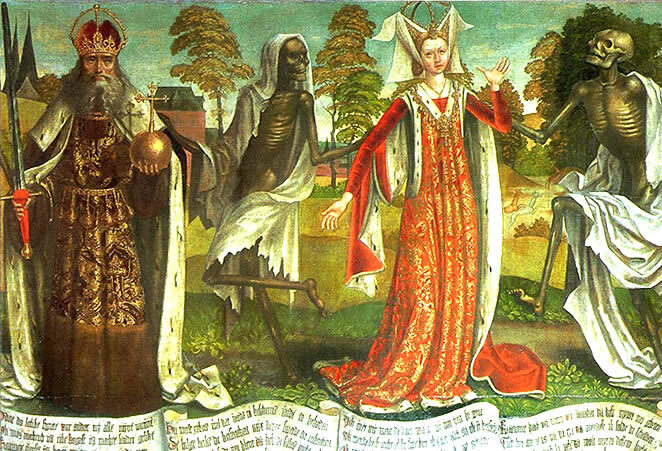 Many religoins deny spiritual death. So do many atheists (myself included). If you're a materialist, then there is no such thing as spiritual life, therefore there can be no spiritual death (depending on how you define spiritual, of course. Here I mean something like "immaterial mind/soul/essence".). 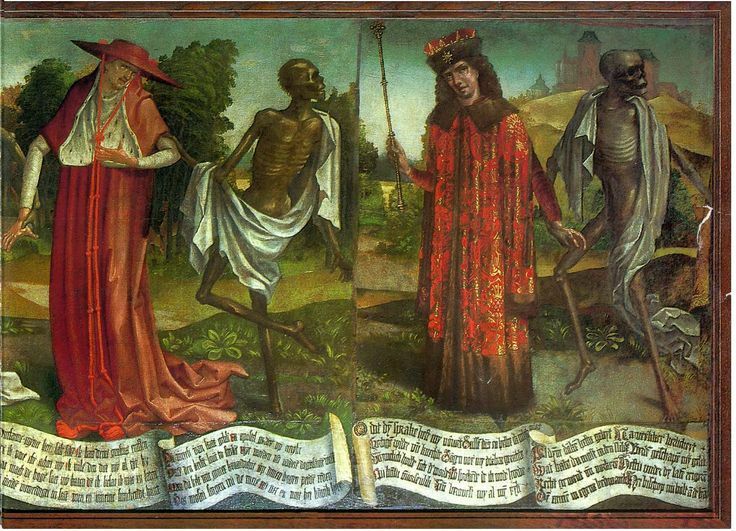 Is the motivation for religious belief some kind of guarantee of the spiritual survival of physical death? Schopenhauer said that if you could totally convince everyone that there was no life after death, religion would die out overnight. I think he was wrong. There are probably lots of motivations for religious belief: moral guidance, a sense of purpose, etc. And the Greeks seem to have got along well enough without believing in anything like our notion of the (spiritual) survival of (physical) death. *Personally, I think the relevance of Jesus' life should be sought for not in how he died (plenty of people were crucified, after all), but in how he lived. Topics like these illustrate it is only really possible to communicate on the most basic of levels and that we are island universes. Everything we take in is mutated and forced to fit our own personal model of our own personal universe. What is religion, what is death, we cannot communicate these things in any deep way because they are feelings, emotions, we only sense them because we are alive, or, we are alive because we not only think we are, but because we feel we are and we only think we think, when in reality we feel we think and thought is just more hopeless, censored crude language. Death is a part of our model of life whether you accept it, welcome it, deny it or fear it. The fear of death is the fear of missing life and its experiences. You didn't fear death before you were born or regret missing all the things that happened, and you won't miss them after you die. You have to be alive to fear death, so life in an abstract way is death and things like fun and happiness are there to confront it, hide from it, binge on having a good time before it claims you, but it doesn't exist. You weren't dead before you were born and you won't be after you die, you will cease to exist which like infinity is a concept beyond our comprehension. Death is the final act of life, once over, death only exists in the feelings of these still alive who await their turn. Life is death because it follows us around and dictates all we do, sometimes without our knowing it. We measure the brightness and worth of our lives against it, like the brightness of a candle in a dark room. Mind you, I'll have a different opinion tomorrow most likely when I have a different head on. Is the subject wallowing in self pity at the thought of his impending death, or is he being kind to those he will leave behind by saying it's the natural order of things like a fire building up from kindling, burning fierce, dying away to a grow, then going out. 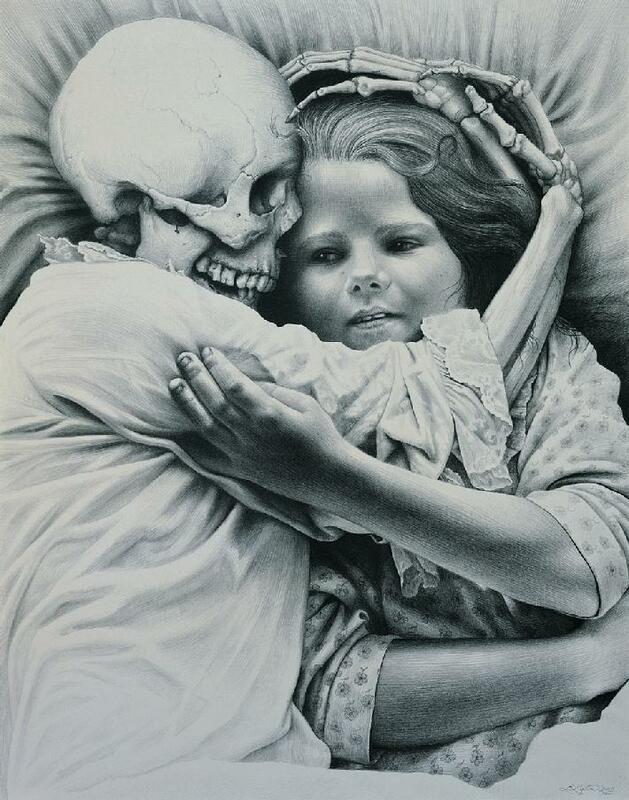 Is he being cruel to be kind by saying don't grieve, it was the man in his youth, in his prime you loved not this corpse, this shipwreck you see dying in this bed. Or is it a final a declaration of love. For me the meaning is in the final 2 lines. I like to think it's a love song. it goes and passes away presently. it leaves man when it departs. amounts at the end to weeping and grief. o, silly man, none of them shall you keep. and put away pride and filth and wrath. and sacrificed their precious blood for you. for certainly otherwise you are mad. how this world goes and how men die. no man can oppose death. On A Portrait Of A Deaf Man, a poem about death, or love, or grief? I don't know. Does it really matter? In country lanes when young. But not the song it sung. Of maggots in his eyes. And painted it in oil. You cut your high teeth on stone, your feet stood firm in the soil, your life is survived by your deeds, we will remember and honor your name. A grave is a grim horse to ride. I passed through the darkness this night with my face pressed into the earth, thin is the veil, thick is the skin to cross the borderlands of flesh. 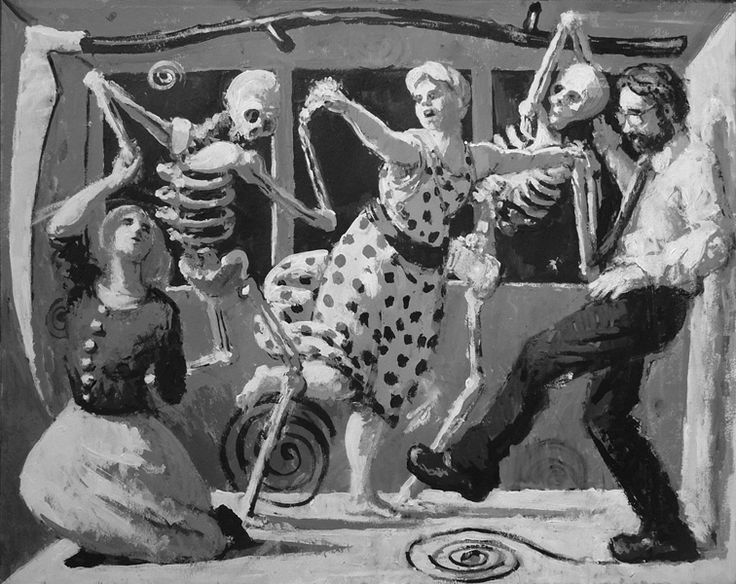 As I lie on this house of bones, speak to me now of time’s strange berries. Do ages repeat all the same? Tell me what you see out there? To cross this bridge of shadow, visions of silence all told what the dead reveal to the living. My blanket can’t keep out this cold. 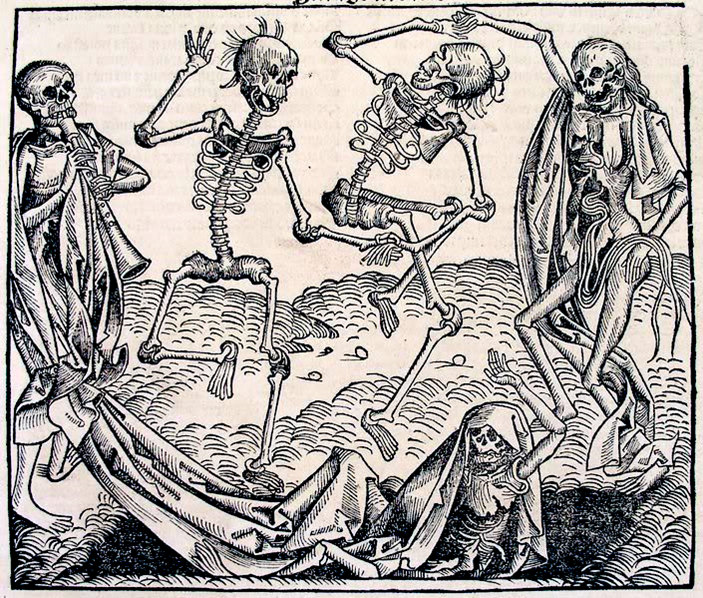 Everybody do the danse macabre... yeah! Last edited by Beerman on Sat Jun 18, 2016 8:32 am, edited 6 times in total. C'mon everybody let's do the shaking of the sheets! Whoop! As I walked out one day, one day, I met an aged man all on the way. His head was bald, his beard was grey, his clothing made of the cold earthen clay. “My name is Death, have you heard of me? All kings and princes bow down unto me. If you will grant me a little while and give me time my life to amend. “I want no gold, I want no pearl, I want no costly rich robes to wear. I cannot grant you a little while, nor give you time your life to amend. “Here lies a poor distressed maid, who in her youth she was snatched away. Last edited by Beerman on Sat Jun 18, 2016 9:10 am, edited 6 times in total.